"The Hiram M. Chittenden Locks, or Ballard Locks, is a complex of locks at the west end of Salmon Bay, in Seattle, Washington's Lake Washington Ship Canal, between the neighborhoods of Ballard to the north and Magnolia to the south"
This photo was sent in by JF. 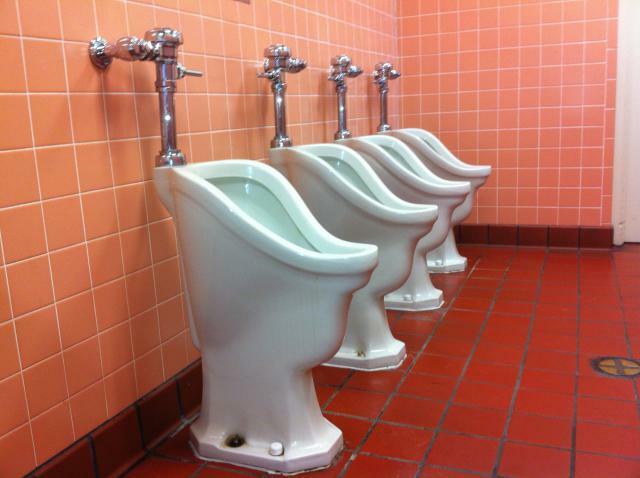 He writes: "These urinals can be found in the outbuilding on the north side the locks. Open to the visitors." The Locks' website proclaims: "100 years ago, The Locks and Ship Canal were built by Seattle and the Corps of Engineers as a commercial navigation route to develop the City of Seattle. Today the Hiram M. Chittenden (aka Ballard) Locks are the Nation's busiest with nearly 50,000 vessels/yr. "locking through”. Boats can lock thru 24 hours/day, except during maintenance. The Locks are a Seattle Icon, National Historic Site and a top tourist site attracting over 1.3 million visitors/yr. The Grounds are open for visitors from 7:00am to 9:00pm. No fees are charged for visitors, commercial ships or private boats. Even guided tours and summer concerts are free."